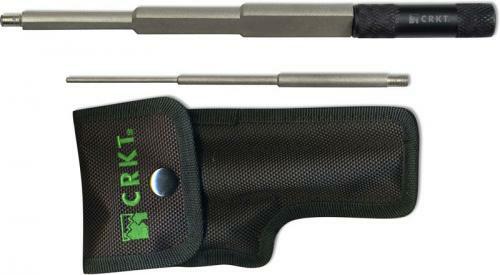 CRKT Veff Sharp Knife Sharpener, two 600 grit diamond sharpening rods with stepped configuration, nylon storage pouch. The illustrated CRKT Knife Sharpener is the CRKT Veff Sharp Knife Sharpener, designed by professional knife sharpener Tom Veff to be the ultimate multipurpose knife sharpener. The Veff Sharp includes two 600 grit threaded diamond rods and a knurled black aluminum handle. The rods of this CRKT knife sharpener have a stepped configuration that provides the user the correct size for most any serration. The 5.88" long small rod has 3/32", 3/16" and 1/4" round sections; the 6.38" long large rod has 11/32", 1/2" and 5/8" D shaped sections with flat side for straight edges and deburring. A black nylon storage pouch is included with this CRKT Knife Sharpener. From the CRKT 2010 manufacturer's catalog: "The Veff Sharp is effective on most serrations and does not create egg-shaped serrations as tapered sharpeners do. It works equally well on gut hook knives and seat belt cutters.